The 14th amendment was adopted in 1868. Its original purpose was to ensure that blacks would not be denied citizenship on racist grounds. 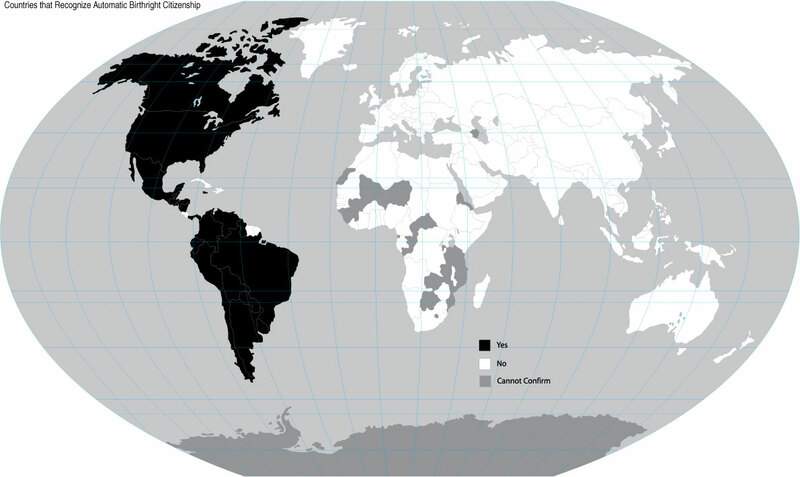 Some on the right have argued that undocumented immigrants are not subject to US jurisdiction, but this claim contradicts legal precedent–in the 1898 United States v. Wong Kim Ark, the Supreme Court ruled that all people born in the US, even children of foreigners, are US citizens. The only exceptions are the children of foreign diplomats and occupying enemy forces. The ruling was 6-2, with one abstention. Argument from the Constitution–these people seem to believe that whatever the constitution says is what should be done, and that those who believe the constitution ought to be amended are hostile to the constitution or are in some other respect violating something sacred. These people fail to recognize that we would not even have birthright citizenship in the first place without a constitutional amendment, and that the constitution has an amendment process precisely because the founders recognized that it would sometimes need to be amended. Many of the amendments subsequently passed have been good, and many people on both sides of the political spectrum support further amendments. For instance, many democrats would like to see a constitutional amendment that would reverse the Citizens United decision. So if birthright citizenship is good, it cannot be merely because it is protected by the constitution but for some substantive independent reason. Argument from Foreign Opinion–these people argue that because many European countries do not have birthright citizenship, this is a good reason to get rid of it. Many European countries also have single payer healthcare, but this has not caused any of the conservatives who want to get rid of birthright citizenship to support that. If birthright citizenship is bad policy, it cannot be merely because other countries do not do it but for some substantive independent reason. The Europeans have steered clear of birthright citizenship because this makes it easier for them to deport people they don’t want. They are less confident that immigration is beneficial due to a mix of population density, historical social homogeneity, and the fact that there is an awful lot of unjustified suspicion of immigrants that practice Islam and/or come from Africa and the Middle East. The renewed discussion of birthright citizenship suggests that more Americans are suspicious of the benefits of immigration, perhaps because they believe that immigrants are going to consume jobs, opportunities, or resources they might otherwise receive. This is intuitively appealing, but ultimately quite mistaken. Immigrants are not merely workers, they are also consumers. This means that immigrants buy things–they contribute to aggregate economic demand. Businesses have to increase supply to meet that demand, which means that while immigrants do take jobs, they also create additional work. Imagine a society in which the population steadily shrinks. As the number of consumers decreases, the amount consumers buy also decreases. Consequently, prices fall and businesses reduce supply, resulting in job losses. Japan has this very problem today–its population is shrinking and it doesn’t have enough domestic consumption to fuel growth. So it’s important to remember that immigrants contribute not merely by expanding the labor supply, but also by contributing to domestic consumption. The US still has room to spare, even its low skill immigrants are economically productive, and they are even more law-abiding than extant citizens. So what reason would the US have to repeal birthright citizenship at this time? I cannot see any. Some republican presidential candidates are championing this policy either because they themselves are poorly informed about the positive effects of US immigration or because they are trying to pander to voters who do. In either case, it’s a sad situation. Birthright citizenship has helped integrate millions of productive people into American life. It’s not broken. Don’t fix it.